What Is the Wicca Sabbat Beltane? 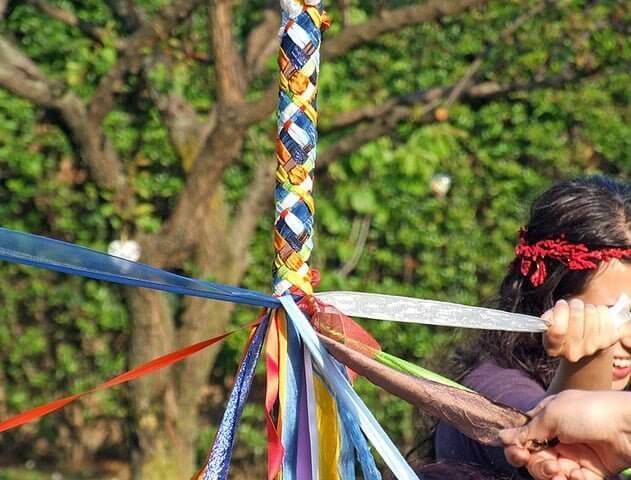 Beltane, more than any of the other Wicca Sabbat fertility holidays, is deeply tied to the concepts of sexuality. The God and Goddess are in their prime, and have now taken a deep interest in each other and are beginning to explore the mysteries of their sexuality. All aspects of this Pagan holiday touch on the concept of health, fertility, the prime of life, sexuality, and sensuality. And this season of the Wicca Wheel of the Year is very much the time for such things. The maypole is a common sight this time of year, the pole itself being a rather blatant phallic symbol. How appropriate that it would be at this stage of the Gods life that his staff does begin to rise! The dancers about the maypole are telling a story, for those who know how to see. The white represents the still virginal goddess, while the red ribbon represents the first appearance of her menstruation, which indicates that she is ready to take the next step into motherhood. The term Beltane means ‘Bale-Fire’, and speaks of the great bonfires once lit all over the Gaelic territories during this time of year. The cattle were blessed this time of year by the Druids.They would build two great fires under great incantations, and the cattle would then be run through them to ensure their health and prosperity in the time to come. While those seeds planted at Imbolc are now firmly rooted, and their growth are well under way. But underway they are still young and vulnerable to shocks of cold and frost. Because of this there is many elements of the Wicca ritual that are tied to fire, the Goddess Brigid is heavily tied to fire in all it’s forms and natures. For his part, the God is most clearly represented in the Wicca Sabbat of Beltane by the Green man, a lover of all things that live, be they in the deep wilds of the forest, or the wildness of the field. He was also known as Robin Hood, or Rob in the Hood, referencing the hoods worn by the Fae folk of the world. The Fae are known to abound at this time of year, the gates to Arcadia having swung wide during Ostara, they now abound in the field. The wee winged ones are out, bringing in Spring, bringing out the flowers whose names they bear. The proper decorations for the altar in Beltane are the bright flowers of the field, and baskets constructed of willow withys, the long flexible branches of the willow tree. Branches of the hawthorn are placed upon the altar, and leafy branches of the oak tree. Figures of the Fae folk may be included, and it would do you no harm to place cookies and milk out for the wee folk!